Indian cricket team’s swing master Bhuvneshwar Kumar has joined Nupur for the preparation of their marriage. Bhuvi is helping his family in the preparations of his marriage. Bhuvi is getting married on 23rd November in Hotel Bravura (Meerut). The first reception will be in Meerut. The second reception will be held on November 26 in Bhuvi’s village Luharli of Bulandshahr. The third reception for the BCCI and fellow cricketers will be held on December 5 at Hotel Taj, Delhi. The special thing is that the third Test match between India and Sri Lanka will be played from December 2 to 6 in the Feroz Shah Kotla Stadium in Delhi. Bhuvi will not play in the second Test also. The first Test is to begin in Calcutta from November 16. The BCCI has announced the Indian team just for the first two Test matches. Bhuvi’s sherwani is specially ordered from Kolkata. According to Bhuvi’s father Kiranpal Singh, Bhuvi’s mother Indresh wanted to order shervani from Kolkata for the marriage of Bhuvi. On the other hand Nupur’s family members have ordered a special Lehnga from Delhi. Nupur’s mother Kamlesh and father Yashpal Singh Nagar live in Noida. Music and a dinner party is being organized by Nupur’s family in Meerut . 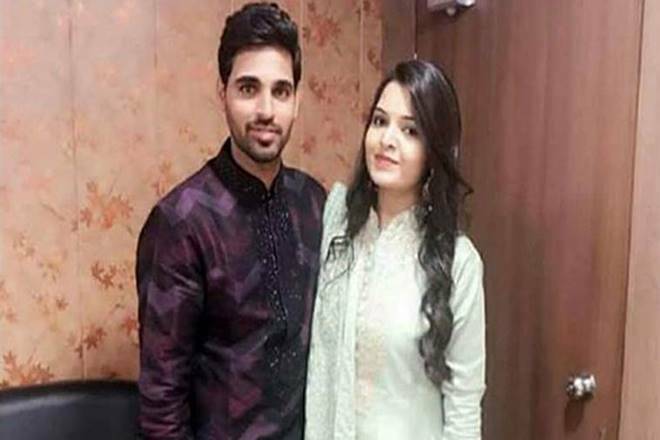 On the other hand, Mehndi and Sangeet program will be held in the Broadway Inn of Meerut on November 22, one day before marriage on behalf of Bhuvi.